Candidates appearing in a competitive examination held for clerical posts in the Gandhinagar civic body Sunday were asked a question related to Patidar leader Hardik Patel. 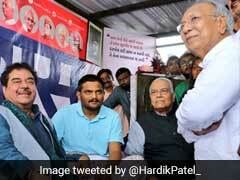 Patidar leader Hardik Patel, who was on an indefinite hunger strike demanding reservation for Patidars and loan waiver from farmers, broke his fast after 19 days, saying he would not play into the hands of those who want to kill him. 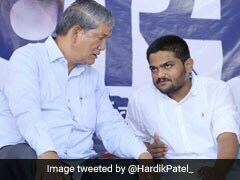 Hardik Patel, who has been on an indefinite hunger strike demanding reservation for Patidars and loan waiver from farmers, was discharged from a hospital in Ahmedabad today. In a Facebook live message, the Patidar leader told his supporters that he would be continuing his fast from home. NDA ally Shiv Sena on Wednesday extended support to fasting Patidar leader Hardik Patel, with party chief Uddhav Thackeray advising him "not to risk your life on insensitive governments".